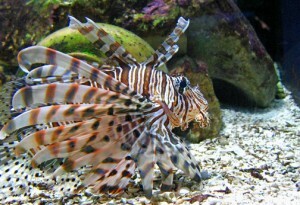 The lionfish is one the most attractive and ornate fishes of the Indo-Pacific coral reefs. They possess greatly elongated – venom loaded – dorsal spines and large pectoral fins that resemble Oriental fans in some and long streamers in others. The large pectoral fins act as a barrier to corral its prey against the reef or to flush out refuging crustaceans. Range: Indian Ocean to Western and Central Pacific. Conservation Status: The lionfish has become an invasive species in many parts of the world. The mimic octopus is thought to mimic a lionfish as one of its defense mechanisms.